Four planets are easily visible as darkness sets in after sunset when August begins. See ever bright Venus in the west, Jupiter a little past the meridian west of the diamond of Libra, Saturn rather far east above the teapot of Sagittarius, and Mars rising. If you’re viewing from the southern hemisphere, it’s five planets for you! Spot Mercury below and left of Venus between Leo and Hydra. If you have the five-planet view, enjoy it while you can. Mercury is heading fast into the sunset and by the 5th or 6th, you shouldn’t expect the sky to become dark soon enough before the planet sets. After inferior conjunction on the 9th, the messenger planet returns to the morning sky. The view as the planet maneuvers in and out of Cancer is good for the northern hemisphere. The best view of Mercury is likely to be on the 26th when it is at greatest elongation 18.3° west of the sun. Venus is moving alongside the stars of Virgo this month. It’s close to Zaniah around the 11th. Zaniah is a triple star system 265 light years away. Two of the stars of Zaniah are so close, they can’t be seen separately even at high powers. But as one star passes behind the other, spectral changes can be detected. Venus is at greatest elongation, 45.9° east of the sun on the 17th. At the end of August, Venus is about to pass by Spica, slightly closer than Zaniah at 250 light years. Spica is another spectral binary whose companions’ gravitational tugs cause the stars to be somewhat squashed or egg-shaped. 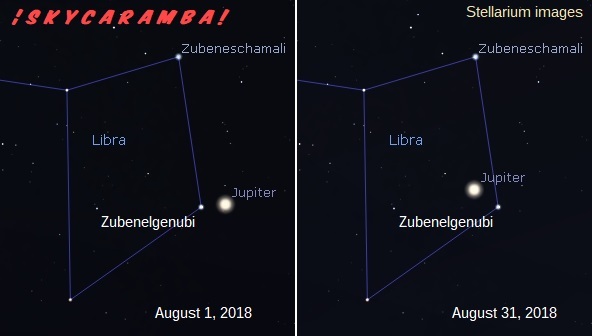 Jupiter is just outside the diamond of Libra and will spend all month close to Zubenelgenubi. On the 20th, the big planet has entered the diamond. It will continue in direct motion and emerge on the other side of the diamond in October. Saturn is moving slowly retrograde and stays near Polis in Sagittarius all month. 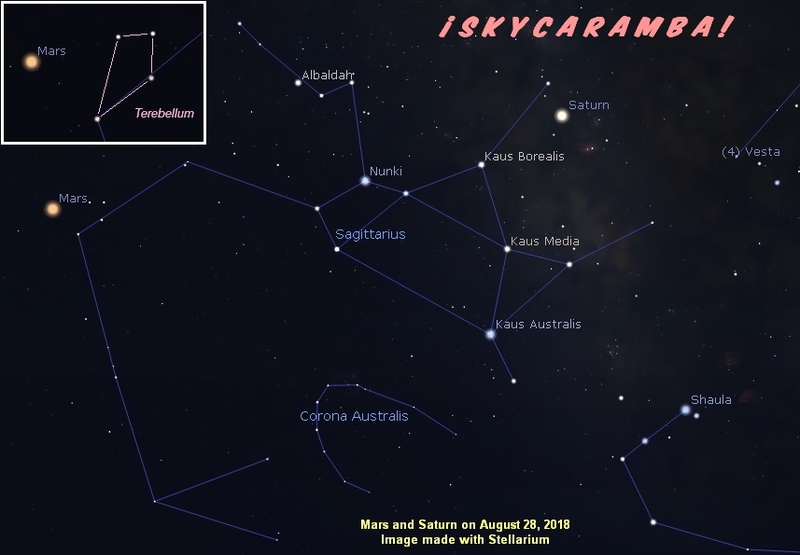 Mars is retrograde and moving toward an asterism in Sagittarius named Terebellum. It almost reaches them in the last few days of August. But the red planet turns around and resumes direct motion on the 28th. Johann Bayer gave the four stars their modern name Terebellum, seemingly because it sounds somewhat like their ancient Greek name Tetrapleuron. Terebellum is a Latin word for auger or bore. Tetrapleuron is the old Greek word for quadrangle. Leo, Leo Minor, Corvus, and Crater are among the constellations disappearing into the sunset this month. Orion and Gemini are becoming prominent in the morning sky with Cancer, Canis Minor, and Monoceros right behind them. There will be a partial solar eclipse on August 11. Greenland, far northern Canada, Scandinavia and other parts of northern Europe, and northern and central Asia will see it. 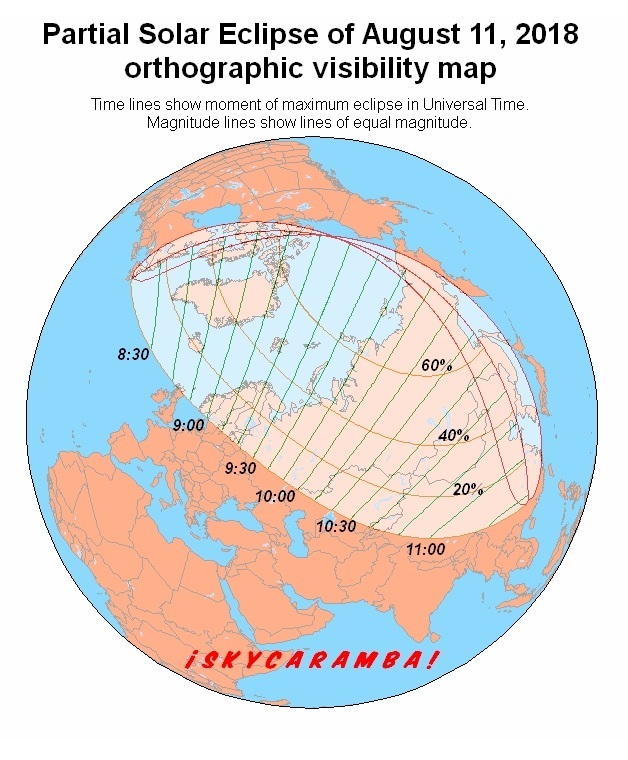 The greatest magnitude will be about 0.74 in the Long Straight between the Russian mainland and Vrangelya (Wrangel) Island. 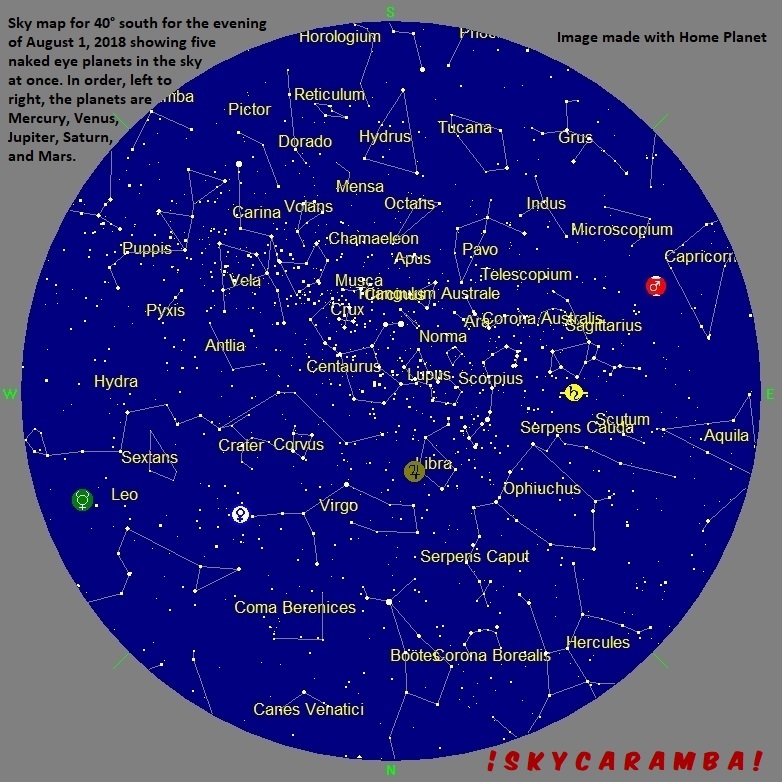 The Perseids meteor shower possible peak date is August 13. That’s two days after a new moon, so there’s little moonlight to interfere. Moon phases this month: last quarter on the 4th, new on the 11th, first quarter on the 18th, and full on the 26th. 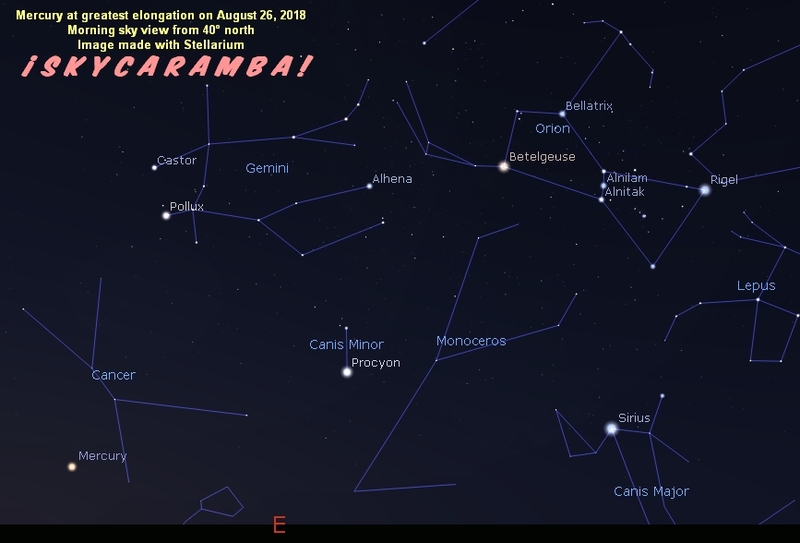 The moon is on the equator going north on the 2nd, farthest north on the 8th, going south of the equator on the 14th, farthest south on the 22nd, and going north across the equator again on the 29th. The moon is at perigee on the 10th and apogee on the 23rd. This month’s Venus-moon conjunction is on the 14th with the planet 5.9° south in the evening sky. The moon is 4.3° north of Jupiter on the 17th. The moon passes 2.1° north of Saturn on the 21st and 6.8° north of Mars on the 23rd.